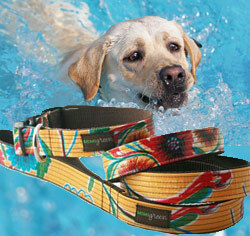 for swimming and mud loving dogs! 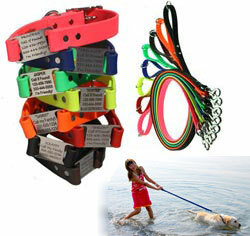 Waterproof dog collars are great for active dogs that tend to get wet and muddy. Unlike most dog collars that will absorb water and odors, these water proof collars are made for the wettest and stinkiest of situations. They are also extremely strong and come in a variety of colors and styles. 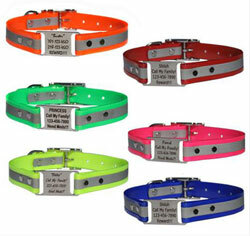 Synthetic dog collars and leads, available in 8 vibrant colors. Personalized with custom engraved Scrufftag™ name plate; up to 5 lines of text. neck sizes 12" - 26"
These collars are created from a special blend of synthetic polymers that won't absorb moisture, retain dirt, or harbor bacteria. 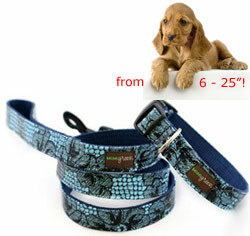 neck sizes 9" - 21"
Durable, stain resistant and water proof designer dog collars? You heard right! Oil cloth collars by Mimi Green, for small dogs and big dogs. neck sizes 6" - 25"
If function is your top priority, these Reflective ScruffTag™ Collars with a built in personalized name plate are the ticket! A high visibility and reflective collar with a custom laser engraved nameplate built in. The joy of waterproof and no stink and the safety of a personalized and high visibility fluorescent dog collar. These synthetic BioThane collars and leads have it all! Neck sizes from 14"-24", for medium dogs and big dogs. In six colors. 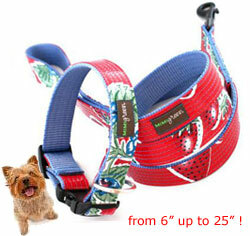 neck sizes 14" - 24"
Durable, stain resistant and waterproof designer dog collars! Oil cloth by Mimi Green, small dog collars and big dog collars. The SunGlo Dog Collar is, in a word, resistant. Resistant to odor, soil, water, rotting, tearing, chewing, and just about anything else your dog can do to it. High visibility, polyurethane coated. 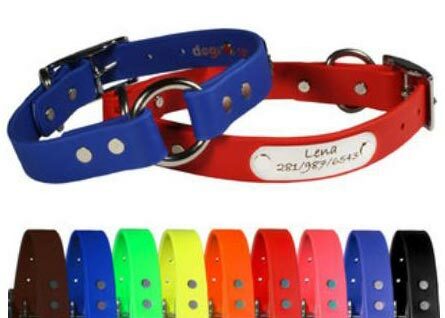 neck sizes 9.5" - 24"
The SunGlo Dog Collar is, in a word, resistant. High visibility, polyurethane coated. 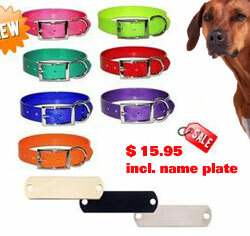 Including a custom engraved name plate for your dog's safety. 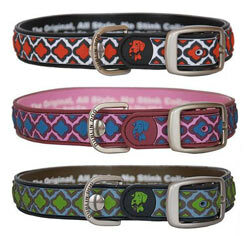 This waterproof dog collar collection comes in pretty designs in pink & blue, red & black and green & blue. 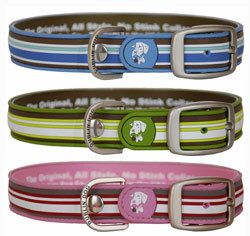 No stink no smell dog collars with a preppy look! If you want a collar that lasts, will never stink and will always keep your dog safe and identified, then the Personalized Soft Grip Safety Dog Collar is for you! 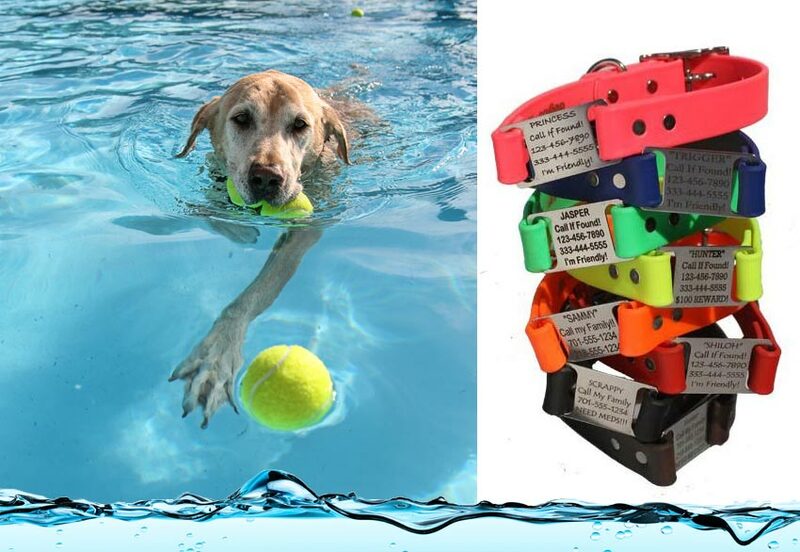 Innovative material makes these collars extremely durable and 100% waterproof. 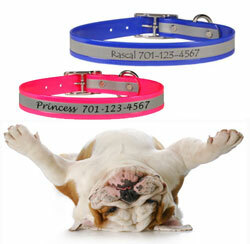 Soft Grip Collars, waterproof & odor resistant. The Safety Ring provides a pivot point. Available in 9 Colors. Engraving guaranteed for life of dog! The camouflage, BioThane strap is made in the USA of poly coated nylon webbing and is waterproof and odor resistant. The strap is perfect for any severe weather conditions and is guaranteed not to crack under extreme cold or heat. The hardware on this collar is 100% corrosion-proof. ScruffTag Nameplate is Built Right In! The best part about the Camouflage ScruffTag Personalized Dog Collar is the built-in nameplate that sits right on the "scruff" of your dog's neck. 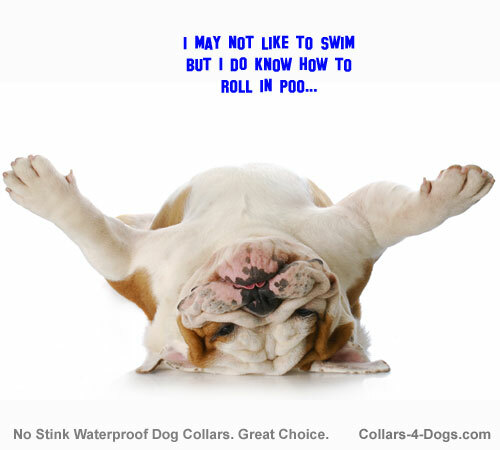 Water proof designer dog collars? Yup! 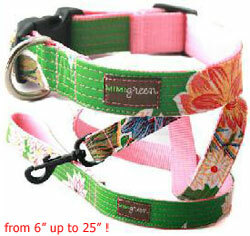 Oil cloth collars by Mimi Green, perfect for small dogs and best for their big brothers. And especially for Labrador Retrievers. 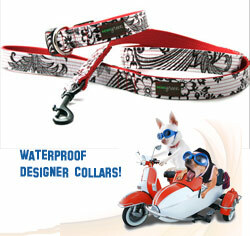 Durable, waterproof designer dog collars! 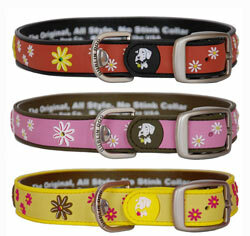 Oilcloth collars by Mimi Green, tiny dog collars for Chihuahuas and big dog collars for Great Danes. Or maybe this black, white and red set is best for a Dalmatian? 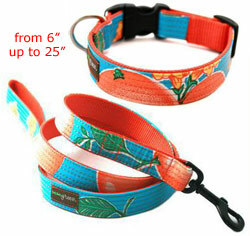 Pretty dog collar and leash in bright sunny orange and cyan sky blue. Waterproof, clean in seconds, dries very quickly after getting wet, dirt and water repellent. From extra small and up to extra large. Waterproof, no smell no stink striped dog collars from the Dublin Dog Company. Stylish and durable, and easy to clean. For pretty dogs who tend to get all wet and dirty. Pink stripes, blue, or green stripe pattern. Waterproof, no smell no stink dog collars, pretty with flowers. The Daisy Daze collection. Stylish and durable, and easy to clean. For pretty dogs who love to get all wet and dirty. 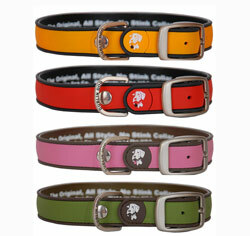 Pink, red or yellow dog collar. Shamrock. Not only for the Irish! Waterproof, no stink dog collars, pretty and tough. The Lots O' Luck collection. Stylish and durable, and easy to clean. For Irish dogs, for Frenchies,.... 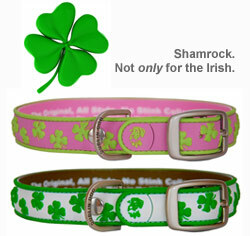 Pink, green-brown or white dog collar. 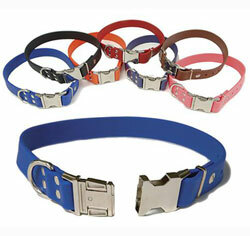 The convenience of a side release buckle dog collar is now combined with an incredibly strong coated polyester. This durable material is easy to clean, will not absorb odors and remains flexible even in sub-zero weather. In 7 solid colors. The Simply Solids collection, from Dublin Dogs. In pretty pink, in blazing red, in safety day glo orange, or in hunter olive green. Easy clean collars for dirty dogs, naughty dogs, pretty dogs, and for practical minded owners. 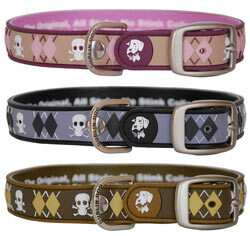 Durable, stain resistant and water proof designer dog collars? That's right! Oil cloth collars by Mimi Green, for tiny dogs and for big dogs. These collars are created from a special blend of synthetic polymers that won't absorb moisture, retain dirt, or harbor bacteria. Camouflage for mud diving dogs! Order, Shop online: buy colorful yellow dog dog collars, inexpensive, affordable designer dog collars, ribbon and nylon dog collars, collar & lead sets from Yellow Dog Collars (dog collar and leash sets); Made in the USA. Choose between 3/8, 5/8 inch wide, or 1 inch wide (approx. 1 cm, 1.5 cm, 2,5 centimeter, 10mm, 15mm, 25mm). Durable, affordable and colorful designer dog collars and leads by Mimi Green, USA, and by the Dublin Dog Company, all American made. 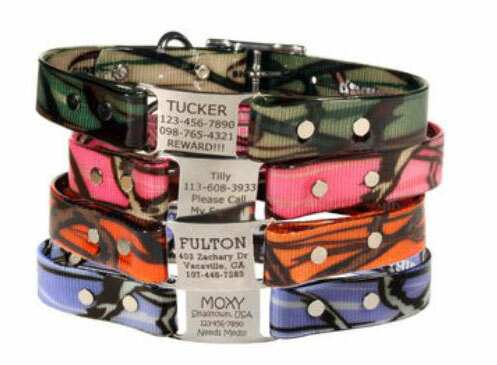 Vibrant color combinations, camo dog collars, sunglo, personalized; all types of waterproof dog collars and leads. For small dogs and big dogs. 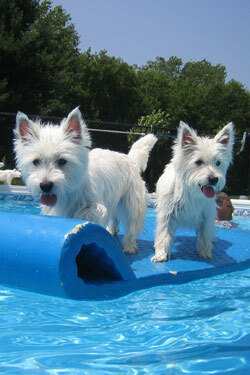 Waterproof dog collars. Practical, durable, waterproof and pretty can all come in one! 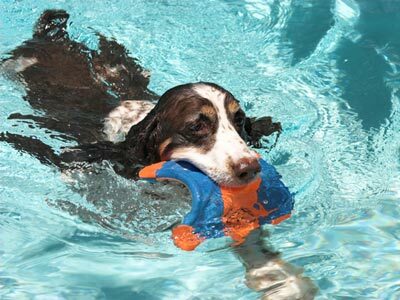 On this page you'll find our waterproof dog collars and leashes. 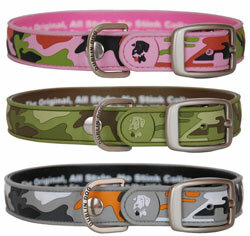 Fashionable colors and designer patterns, camo, personalized; all are water proof and suit small dogs and big dogs.